One of my favourite spots in Helsinki is a yarn shop, Snurre. It’s not my favourite simply because of the yarn it stocks; it’s my favourite because of the people who own and run it—Anne and Mikko. I’ve spent a fair amount of time in Snurre as a customer, teaching knitting classes, at various knitting / crafting events and to help celebrate milestones in the store’s brief history thus far. It’s evolved incredibly since opening a little over two years ago, and I’m thrilled to see this local shop doing so well. It’s a great place to spend a little time with fellow crafters and in fine, fine company. In addition to being a place my knitting friends and I enjoy going together, I’ve made a few new friends there as well. Obviously, Anne and Mikko are two such friends. Today, they surprised me with a holiday gift (above) that was so, so unnecessary, and so incredibly thoughtful. Wine and yarn. 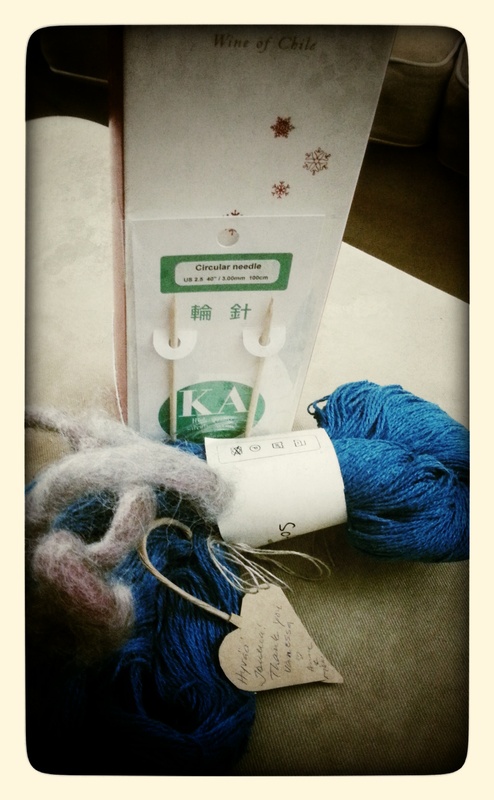 And, knitting needles for the yarn. (Like I said: perfect!) I am touched beyond words once again, not just by their generosity, but that they have included me in their community. There are plenty of yarn shops in Helsinki, but Snurre will always be special to me because of Anne and Mikko. Always ready to greet those who enter warmly and with friendly and genuine smiles. Always ready to help those who enter find just what they are looking for. And, always interested, genuinely interested, in how you are doing and what’s new — not just in the world of all things fibre, but in life in general. Because of their sincerity and the care with which they treat those of us who return again and again and because they are such great people overall, I’ll do whatever I can to support their business and to help it thrive. As members of a ‘community’ of crafters, it’s a great thing to have Snurre amongst the tribe and the go-to place for all one’s fibre needs. And, it’s a local business I feel incredibly good about supporting in whatever way I can because they make the community a better place. Thanks, Anne and Mikko, for your kindness! And, thanks for helping make me feel so incredibly welcome in your community!